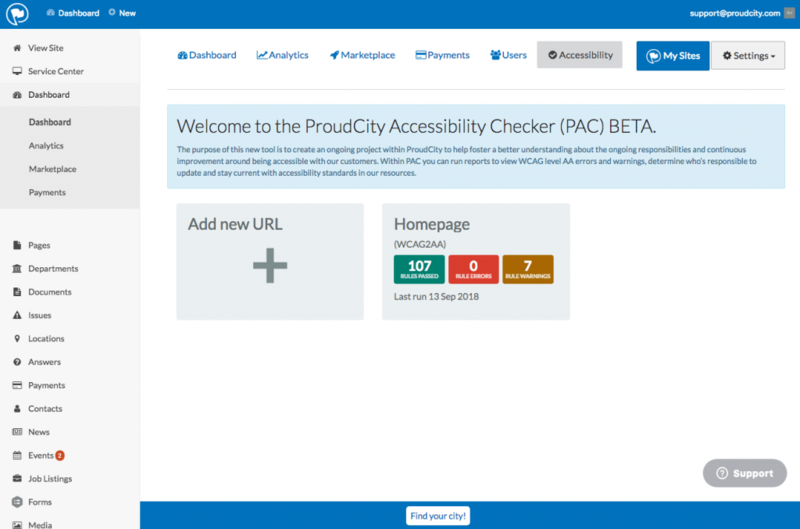 The ProudCity Accessibility Checker helps governments using the ProudCity Platform understand and stay abreast of pertinent accessibility issues and continue to maintain AA conformance. 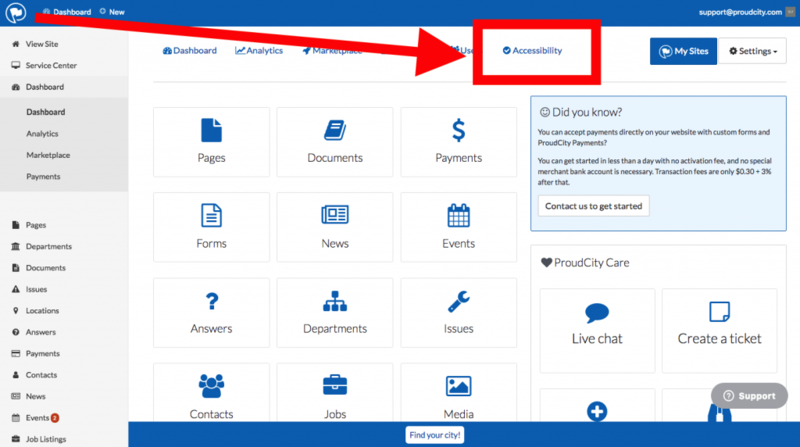 PAC lets government website managers run accessibility reports, view errors/warnings, and resolve these issues immediately. 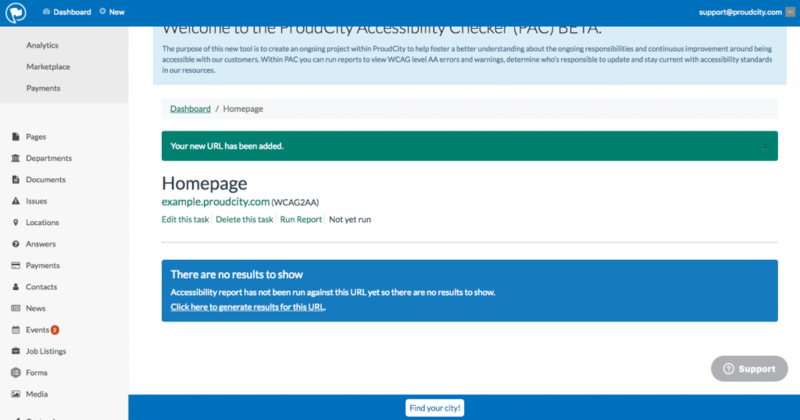 PAC allows you to enter page URLs into a form field and test page accessibility. A status report will generate that shows, if any, the issues that need to be addressed to be more in compliance with 508 standards. 1. Locate PAC in the ProudCity Dashboard. 2. Click the ‘Add new URL’ box in the PAC Dashboard. 3. Enter the name and URL into the ‘Add a new URL’ form and select the ‘Add URL’ button. 4. After submitting the URL, a generate report message will appear. Click the ‘Click here to generate results for this URL.’ message. 5. 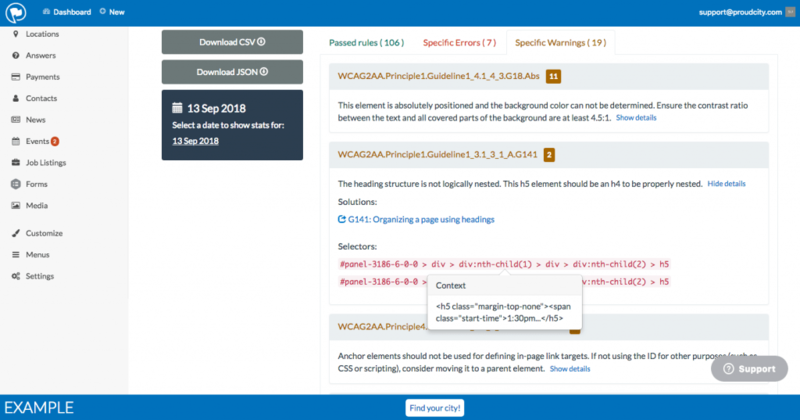 Once the report runs, you will see ‘Passed rules,’ ‘Specific Errors’ and ‘Specific Warnings’ and can click through to see descriptions of each. 6. The report will show up on the PAC dashboard, where you can edit/delete/re-run as well as add more URLs. 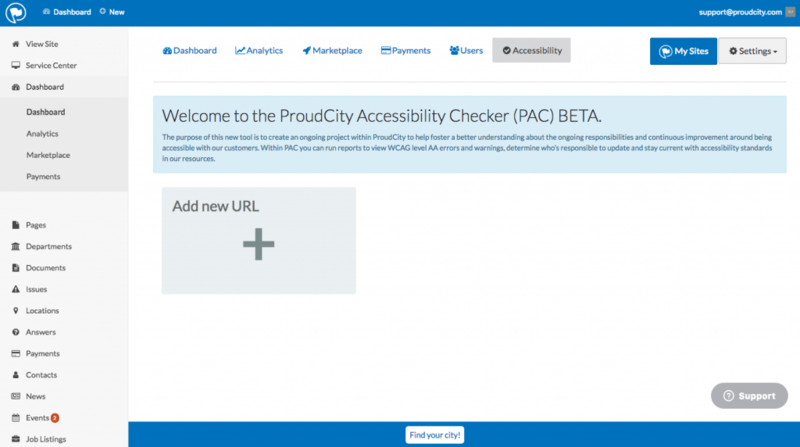 Passed: Issues checked by the ProudCity Accessibility Checker (PAC) that pass WCAG level AA accessibility standards. 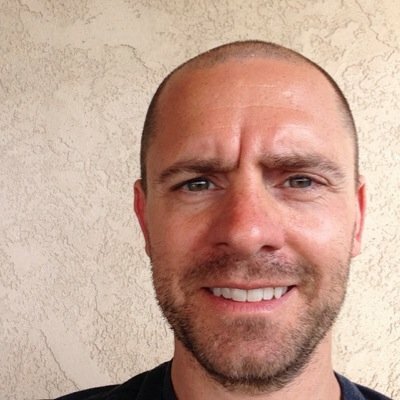 Errors: Issues detected by PAC that must be fixed. Warnings: Potential issues PAC detected that may require manual inspection to determine problem severity. Are often non-technical, content-related fixes. NOTE: Some errors and warnings pertain to items ProudCity is working to resolve within the general theme. If you are unable to resolve errors/warnings yourself and have questions about any of the reports, contact ProudCity using the online chat/ticketing. 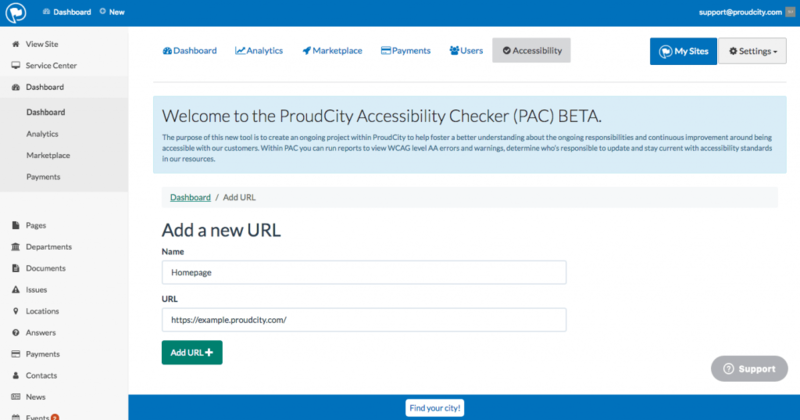 We are continuously enhancing the ProudCity Platform accessibility features. Visit our accessibility development issues queue to learn more about what we’re working on and future updates.